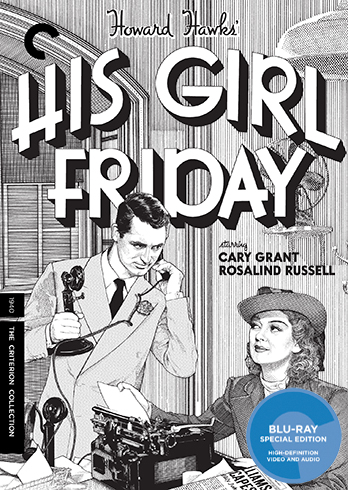 One of the fastest, funniest, and most quotable films ever made, His Girl Friday stars Rosalind Russell as reporter Hildy Johnson, a standout among cinema’s powerful women. Hildy is matched in force only by her conniving but charismatic editor and ex-husband, Walter Burns (played by the peerless Cary Grant), who dangles the chance for her to scoop her fellow news writers with the story of an impending execution in order to keep her from hopping the train that’s supposed to take her to Albany and a new life as a housewife. When adapting Ben Hecht and Charles MacArthur’s smash hit play The Front Page, director Howard Hawks had the inspired idea of turning star reporter Hildy Johnson into a woman, and the result is an immortal mix of hard-boiled newsroom setting with ebullient remarriage comedy. Also presented here is a brand-new restoration of the 1931 film The Front Page, Lewis Milestone’s famous pre-Code adaptation of the same material.